I am seriously going to miss my peaches this time around. I love me my peaches, especially from the Pacific Northwest, we get them a little longer around here. I have bought enough to make jam, chutney, pies, galettes, cakes, and freeze them! I usually buy boxes of them from fruit stands and farmers so I can freeze them to enjoy smoothies for months to come. 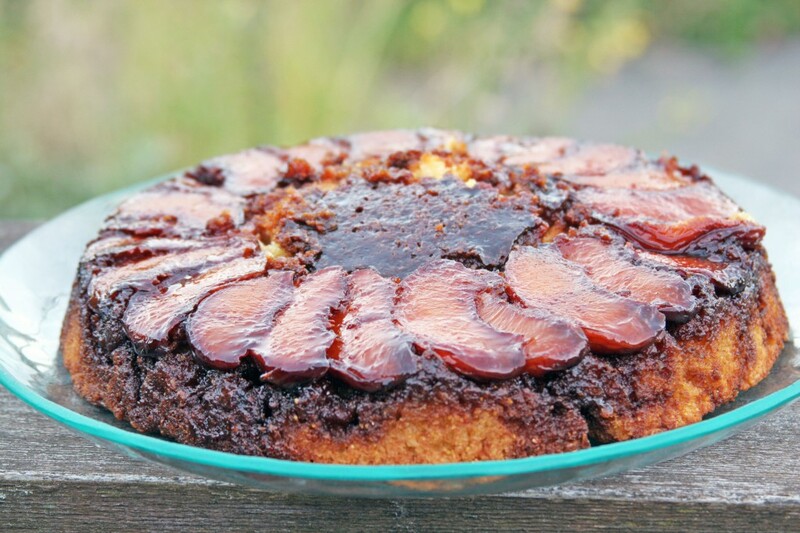 But for now, this Upside Down Peach Cake is what’s on the menu and my whole family is super excited about it! This cake is a bit sweet but not overly sweet. I reduced the sugar in it just a touch and it is perfect for us. It has a super tender crumb with a savory notes from the cornmeal, which I LOVE. It gives it a unique texture and a serious favorite way to a cake for me. This cake is perfect for dessert and breakfast with a nice cup of coffee or tea! Enjoy these last days of warmer days and cool nights with a peachy keen cake. Adapted from my favorite baking cookbook, Rustic Fruit Desserts. You can use any stone fruit such as, apricots, plums, or pluots, as stated in the book. Place a 10 inch cast iron pan over medium heat, add the brown sugar and butter. Stir until the sugar dissolves and cook for 2-3 minutes to make a quick caramel. Remove pan from heat and place the slices of fruit in a circle. In a medium bowl, add flour, cornmeal, baking powder, baking soda, and salt, whisk to combine. In the bowl of a stand mixer fitted with paddle attachment or a bowl with a hand held mixer, add butter and sugar. Cream together on medium for 10 minutes, until light fluffy and light in color. Turn to low, add one egg at a time and wait to incorporate before adding next egg. Turn off mixer, scrape down the sides, add the vanilla, mix to incorporate on low. With mixer on low, add the flour in three additions alternating with the buttermilk in two additions. Start and end with the flour. Pour batter on top of the fruit. Place pan in the oven for 45 minutes or until toothpick comes out of center clean. Cool for 20 minutes before slicing and enjoying! Store leftovers covered in fridge for a few days. This cake looks so amazing! & I can just imagine how fabulous it must smell. I definitely need some of this before the season’s over. Eileen recently posted..Banana nut & oat bars! Get at it! It. Is. To. Die. For. This looks amazing. I love peachy desserts!